This post is mostly economics, but I promise a small bit of undead action at the end. As both an economist and a screenwriter, I loved the Planet Money podcast’s recent episode on “The Scariest Thing in Hollywood.” The episode shows how, from the standpoint of return on investment (ROI), making super-low-budget movies can actually be superior to making big-budget blockbusters. However, I think the episode has one misstep: it commits what I call the “Sunk-Cost-Fallacy Fallacy” — that is, the error of using the Sunk-Cost Fallacy to condemn choices that are (or at least may be) perfectly rational. Here’s the context. The show follows the production of the movie “The Boy Next Door.” (As an aside, this movie is best known to me and my wife as the movie that features a “first edition copy of the Iliad.” Ponder that for a moment.) The movie was directed by Rob Cohen on a tiny budget of $4.2 million. When it was done, focus groups delivered “meh” responses. But Cohen believed that just a little more money — $300,000 — could fix a couple of key scenes and turn the movie into a hit. The film’s producer, Jason Blum, said no. One of his rules for making low-budget movies with high ROI is “never ever break your budget,” and he stuck by that rule. However, Cohen persuaded the film’s distributor, Universal, to throw in the extra $300K. And ultimately, despite lousy critical reviews, “The Boy Next Door” grossed over $50 million worldwide. The episode characterizes Cohen’s desire to use $300K to rescue the movie as a case of the Sunk-Cost Fallacy. But that characterization, I suggest, is itself a fallacy. Because you have already invested (sunk) a bunch of money and resources into a project, you decide to spend more money to “bail out” your losses, i.e., to make benefits materialize that will justify the costs you’ve already incurred. This is the version of the fallacy that the episode’s producers are thinking of when they analyze Cohen’s decision. Because you have already invested (sunk) a bunch of money and resources into a project, you continue to count those costs in the present for making present decisions. That is, you evaluate your decision looking at “all revenues” versus “all costs,” when you should be looking at “present/future revenues” versus “present/future costs.” This is the version of the fallacy that actually occurs in the episode — not when Cohen wants to spend more money, but when Blum refuses to break the budget under any circumstances. Think about it this way. The $4.2 million budget is already gone. So the relevant question is this: How much will another $300K increase the movie’s revenues? Let’s suppose that, without the extra $300K, the movie would have grossed $49.9 million. The $300K infusion raises the take to $50 million. In that case, the $300K is a bad investment because it reduces the net by $200K. On the other hand, suppose that without the extra $300K, the movie will only gross $20 million, whereas with the extra $300K it will gross $50 million. In that case, the $300K is an awesome investment because it increases the net by $29.7 million. So there are really two possible errors here: overestimating the added revenue, or underestimating it. Now, it’s entirely possible that Cohen was engaged in some wishful thinking. Maybe the movie would have grossed $50 million even without the “fixes” he had in mind. But it’s certainly not fallacious to contemplate the possibility that some changes will generate added revenues that more than cover the added cost. What is fallacious is assuming that can never happen, as Blum’s “never break the budget” rule suggests. Now, Blum’s rule may have a good justification. It may help him to resist wishful thinking that exaggerates the possible gains from added spending. Following the rule ruthlessly might make it easier for him to say “no” to every director (like Cohen) who wants to spend a little more. But the rule also has the downside of shutting down some potential improvements that lead to net gains. In considering the value of continuing a relationship versus walking away, you should be careful not to fall prey to the sunk cost fallacy. Sunk costs are costs that have already been incurred and cannot be recovered, and the fallacy is letting them influence your choices. For instance, suppose you’ve bought a nonrefundable ticket to see a concert (Vampire Weekend, naturally) on Sunday night—and then you get invited to a True Blood viewing party on the same night. In deciding what to do, the $100 you’ve already spent on the concert ticket is irrelevant, because you can’t get it back anyway; the only thing that matters is whether you would enjoy the concert or the party more. Likewise, the time and effort you’ve spent building a relationship are sunk costs. You’re never getting them back, no matter what you do. But what does matter is what your time and effort have bought you: the shared routines, memories, home, and so on, whose value will decrease or vanish if you break up. The value of these relationship-specific assets might, indeed, be enough to justify continuing your cross-the-grave romance. I will be speaking on three panels at Westercon68 in San Diego, including a panel on “The Working Dead” and “Economic Recovery After the Zombie Apocalypse.” If you’re attending, please come by and introduce yourself! But if that were the end of the story, Brown and Prag’s chapter would have been very, very short. It turns out that insurance might indeed play an important role in how we deal with zombies – just not during a full-blown zombie apocalypse. If zombies fail to cause the collapse of civilization and instead become more of an ongoing threat, much like car accidents and house fires, then we might well see the emergence of a market for zombification insurance. It might be stand-alone insurance to cover expenses from zombie infections and other undead damage, or it could be packaged with other forms of insurance such as life insurance, health insurance, and homeowner’s insurance. Depending on the contractual language, it’s possible that you’re already covered against zombie-related damage under your current policy! One potential problem with zombification insurance, unmentioned by CareFirst, is that insurance can create moral hazard: the tendency of people to take greater risks when insured against losses. For instance, people with zombification insurance might not be as diligent about decapitating and disposing of the infected bodies of loved ones. It’s a tough thing to do anyway, and if there’s a chance Granny isn’t really infected, or if you think there’s a chance of a cure (or, as Brown and Prag suggest, cryonic preservation until such time as a cure is invented), you might take a chance on waiting. The insured might also take a chance on love with a zombie, as in the movie Warm Bodies. To deal with such contingencies, insurance providers might require substantial deductibles and copayments in order to expose the insured to some portion of the risk they create and provide an incentive to contain it. Why not? Because if vampires procreate via their bite, then each vampire bite converts a potential blood seller into a blood consumer (i.e. a fellow vampire) and thus every vampire bite reduces the aggregate supply of blood. At some point, vampires (blood buyers) will not only outnumber humans (potential blood sellers) but the number of humans or sellers will dwindle to zero and the market for blood will collapse. This notion of “peak blood” is similar to the familiar and oft-lamented problem of “peak oil” — the point in time when the maximum rate of extraction of petroleum is reached after with the rate of petroleum extraction is expected to enter terminal decline. Lastly, notice that the “peak blood” argument assumes that markets move toward some equilibrium or end state. But, frankly, I don’t think this standard equilibrium assumption is warranted. What if, instead, markets are open-ended, evolutionary, creative processes? In my previous post, I considered human-centered arguments against blood markets: either we don’t believe in vampires or we fear them. Now, let’s consider a different set of arguments against blood markets and the possibility of human-vampire trade generally — not from our human point of view, but rather from the point of view of the vampires! This line of argument offers an alternative explanation of vampire violence. Vampires are violent not because of the lack of blood markets (my claim in my essay “Buy or Bite?” in chapter 12 of Economics of the Undead) but rather because they are culturally and biologically superior to humans. Because of their superiority, vampires view humans as prey. Consider, by way of example, this statement by Arkley the vampire in David Wellington’s Laura Caxton Vampire Series: “It’s the natural order. [We] are predators. You and your kind are prey, that’s all. To survive, we must feed on your blood.” In other words, predators don’t negotiate with prey; they hunt and kill them instead. Certainly, I do not deny that vampires are an accomplished and talented lot. Nor do I deny that most vampires probably view humans as prey and not as possible trading partners. Let us assume, then, that vampires are not only a different species but also a more advanced species than us humans. What effect would these assumptions have on the market for blood? Do such innate vampire feelings of superiority inhibit such trade or make such markets more likely to occur? If vampires are so smart, they will immediately grasp the advantages of trading over hunting. Simply put, the prospect of hunting for human blood is not an attractive one because such behavior invites lethal retaliation from vampire slayers. A legal market, by contrast, promises to supply the vampire race with regular and stable supply of blood at the best possible price. In other words, even if vampires are somehow culturally or biologically superior to humans in every possible way, why would any individual vampire want to waste time and effort hunting for blood or invite the risk of deadly retaliation if a safer and more attractive option (legal markets) were available to him or her? But what if vampires prefer the thrill of the hunt to the security and stability of a legal market? What if vampires prefer raiding to trading? Mathematician Thomas Woolley and coauthors claim that mathematical modeling can help us understand the movement of zombies, and thus how best to avoid encounters with them. Naturally, we here at Economics of the Undead applaud the application of theoretical models to zombies. But Woolley’s model provides an excellent example of why theory has to be tested against data – in this case, the observed behavior of zombies in film and fiction. According to Woolley et al., zombie movement can be described as a “random walk,” a notion that has been employed in theoretical models in both physics and economics. Basically, the idea is that each step of a zombie is a random draw: he could move one step in any direction, and then another step in any direction from there, and so on. Over time, Woolley and his coauthors argue, this should lead to diffusion of zombies over the available domain. But this is inconsistent with how zombies actually behave, if existing zombie narratives can be taken as any guide. Rather the diffusing over the landscape, zombies tend to appear in clusters and mobs, even long after the initial invasion. In a conflict between observation and theory, it pays to look for a better theory. And fortunately, there is one available. 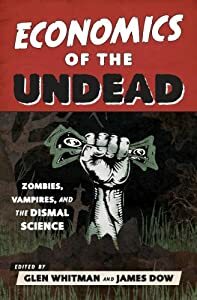 In Chapter 7 of Economics of the Undead, “Order, Coordination, and Collective Action among the Undead,” Jean-Baptiste Fleury and Alain Marciano suggest that zombies do not simply wander about randomly attacking people, but in fact display a range of behaviors that allow them to coordinate their behavior for mutual advantage (with other zombies, not with humans). Among other things, zombies tend to flock together for strength in numbers — the best-known example being the famous “zombie ant-pile” seen in the movie World War Z. Due to limited agility and cognitive abilities, a zombie is not much of a threat when hunting alone. Many action sequences in The Walking Dead TV series illustrate this point: Rick and his friends are generally pretty effective when it comes to fighting with roaming individuals as well as small groups of zombies. But when attacked by hordes of “walkers,” as in the last episode of the second season, Rick and his friends are quickly overwhelmed and eventually escape only at great cost. As confirmed in many accounts, such as Romero’s Night of the Living Dead, flocks of zombies are most dangerous to humans: they can exert tremendous collective pressure so as to break down manmade barriers and barricades. Thus, zombies tend to gather in stable groups, which help them maximize their chance of success in case of confrontation with humans. But what could be the source of such cooperative tendencies? Fleury and Marciano suggest three possibilities. First, zombies may retain some basic tendencies written into their human DNA, including the basic desire to congregate with others of their kind. Second, they may retain some rudimentary memories of their prior human existence and cultural background. (In Romero’s Dawn of the Dead, one character famously explains the convergence of zombies on a shopping mall as resulting from “a kind of instinct, a memory [of] what they used to do” because “this was an important place in their lives.”) Third, the zombie virus itself may endow its hosts with any number of tendencies beyond the obvious craving for human flesh. It is well-known that parasites can affect the behavior of hosts – the most famous example being toxoplasma gondii – so it shouldn’t be surprising to find the zombie virus does so as well. Whatever the cause, Fleury and Marciano’s claim is borne out in countless zombie narratives. Despite their shambling gait, zombies do not appear to follow a random walk. By all indications, zombies are guided instead by a tendency to flock with other zombies in a manner that increases their efficacy in confronting their much-smarter human prey.